Topics: Locksmith Services, Burglar Alarms, Door Entry Systems, Safe Engineering, and Physical Security. amberley-security.co.u.. Access Control, keypads, digilocks, card system, proximity system ..
amberley-security.co.u.. Robust Steel Security Doors, installed in Portsmouth, Southampton ..
amberley-security.co.u.. 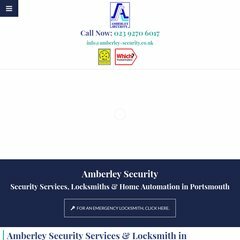 Door Entry Systems, Door intercoms, doorphone, covering Portsmouth ..
amberley-security.co.u.. Safes, strongboxes, fire safes, data safes, floorsafes, covering ..
Amberley-security.co.uk's server IP number is 81.21.75.42. It is hosted by Dh-sr-nix (England, Leeds,) using Apache/1 web server. Its 2 nameservers are ns1.turbodns.co.uk, and ns2.turbodns.co.uk.